The body’s biochemical response to the therapeutic touch combined with a sincere healing intention never ceases to amaze me. The dazed look on their faces; at times their tears in response to an emotional block being released, a soft sleepy smile, a big releasing sigh and deep inhalation of breath. I have been privileged to work with many clients, family and friends during my time as a massage therapist and have witnessed the effects of their biochemical response to my touch. It is my belief that the human body wants to be in homeostasis, it wants to heal and craves balance on all levels – mind, body and soul. Being a therapist you begin to see patterns of response emerging and I have noted many changes in clients who regularly receive massage as part of their wellness journey. These changes include: Better sleep, improved mobility to less tension in their muscular structure to feeling happier and less tense and stressed overall. reintegration of National Guard veterans and their partners using a self-directed program https://journals.lww.com/lww-medicalcare/Fulltext/2014/12001/A_Systematic_Scoping_Review_of_Complementary_and.15.aspx. Studies have been carried out by reputable medical establishments such as The University of Miami School of Medicine, whereby they quantified the biochemical response within the human body prior and post massage. The study reported that the lowering of cortisol levels, the flight and fight hormone released under stress was reduced by 53%! They also recorded the increase of the feel good and pain relief hormones such as serotonin and dopamine respectively. 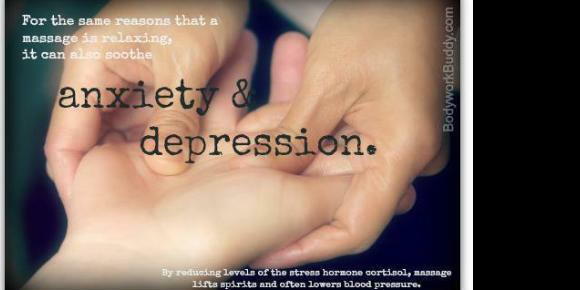 Therapeutic massage has been recognised as impacting positively upon those all-important neurotransmitters and utilised within a broader treatment plan for people with varying Mental Health disorders can have a significant positive impact. If at this point you’re thinking; what the heck is she babbling on about, let me break it down for you. •Mental Health Disorders – Basically is a lot of different conditions that effect peoples mood, behaviour and thinking. Some of the most common conditions are that of anxiety, depression and eating disorders. Massage will aid you in releasing tension from your muscular structures helping to reduce stress related headaches, anxiety symptoms etc. Now when you combine all of this with good nutrition, regular exercise, a healthy nervous system and meditation you can help to treat mental health disorders in a more holistic way and make a real impact upon your body’s health. Spread the good vibes, love yourself and make massage part of your life today. Happy healing.